Director: Tom Hooper. 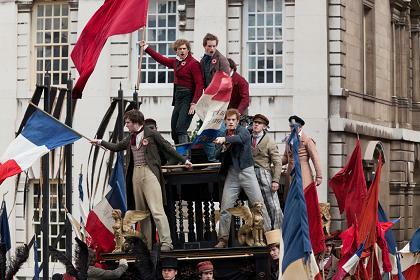 Cast: Jean Valjean, Russell Crowe, Anne Hathaway, Eddie Redmayne, Amanda Seyfried, Samantha Barks, Helena Bonham Carter, Sacha Baron Cohen, Aaron Tveit, George Blagden, Killian Donnelly, Fra Fee, Gabriel Vick, Daniel Huttlestone, Isabelle Allen, Natalya Angel Wallace, Colm Wilkinson, Richard Dixon, Michael Jibson, Kate Fleetwood, Bertie Carvel, Tim Downie, Nicola Sloane, Daniel Evans, Adrian Scarborough, Julia Worsley, Keith Dunphy, Marc Pickering, Patrick Godfrey, Alistair Brammer, Stuart Neal, Hugh Skinner, Hadley Fraser, Michael Sarne. Screenplay: William Nicholson (based on the stage musical by Claude-Michel Schönberg, Alain Boublil, Herbert Kretzmer, and Jean-Marc Natel, itself adapted from the novel by Victor Hugo). Twitter Capsule: Cheap pomposity. Unspeakable direction. Not one story beat or actor really well-served. Utterly abstracted emoting.